I absolutely love this look. It’s so classic. 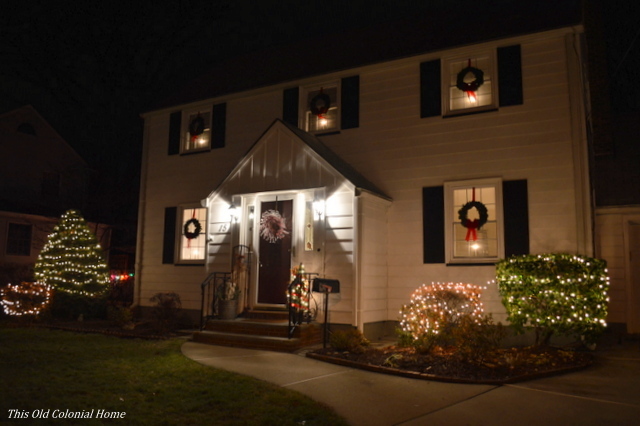 Plus, the house looks festive throughout the day, not just at night when the lights come on. 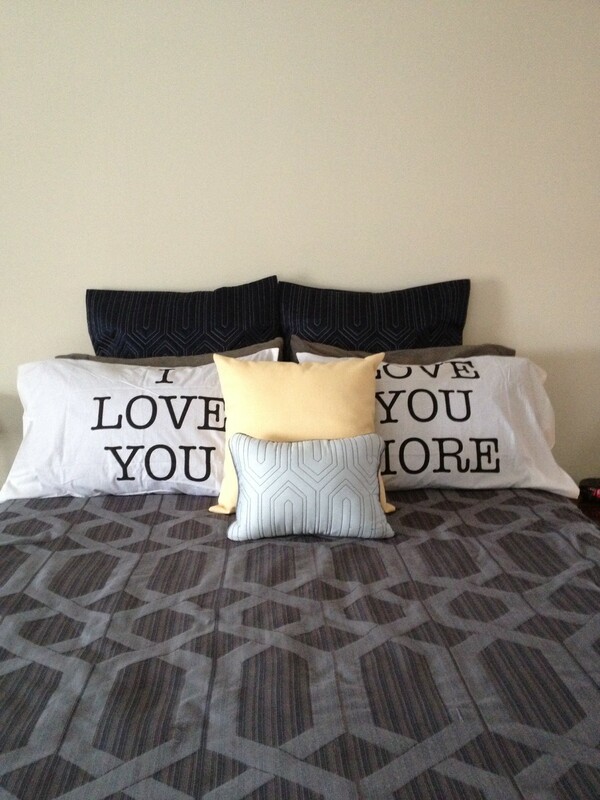 Luckily this decoration task turned out to be easier than I thought it would. All I had to do was attach the bows to the wreaths using the twist ties they come with. 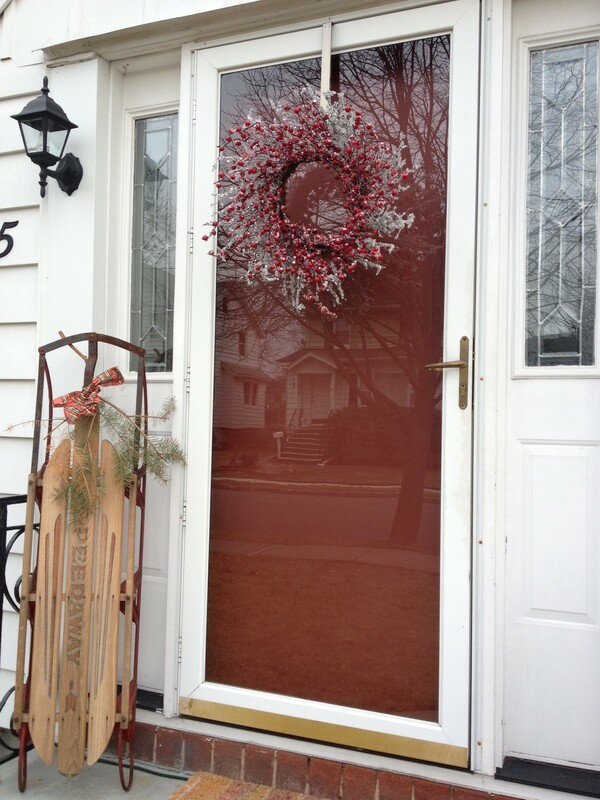 Then I just looped ribbon through the wreath and put each one out the top portion of our windows. I simply closed the window on the ribbon and tied a knot on the inside. The hardest part was making all the wreaths even, but all it took was a few little tweaks here and there. And that’s it! 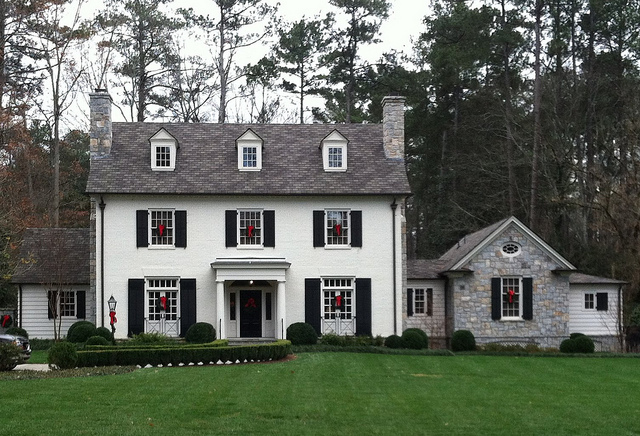 Now we have (in my biased opinion) a stunning, Christmas card-esque house. I just want to stand outside and stare at it! 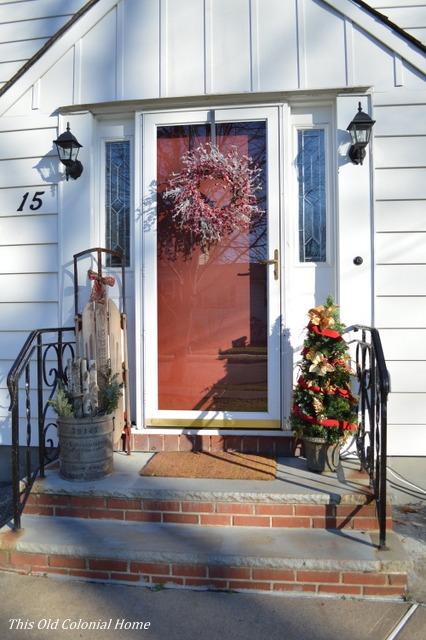 As for the rest of the decorations, the wreath on the front door is also from Hobby Lobby. What I love about it is that it’s not just Christmasy and it can stay out all winter long! 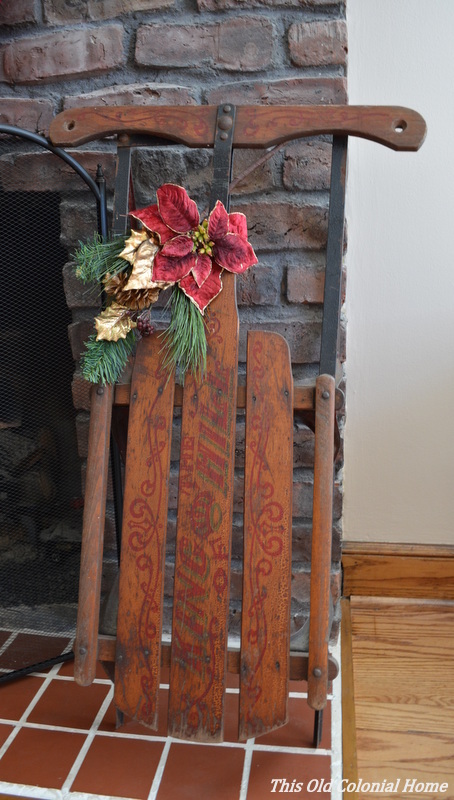 We also added our antique sled that I picked from someone’s curbside trash last year. 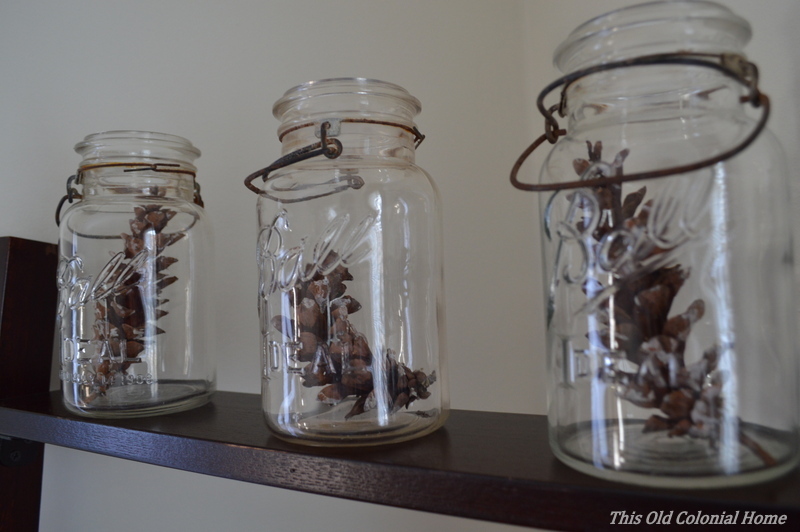 And I repurposed my metal bucket again, this time to hold some wood, tree branches, and pine cones. 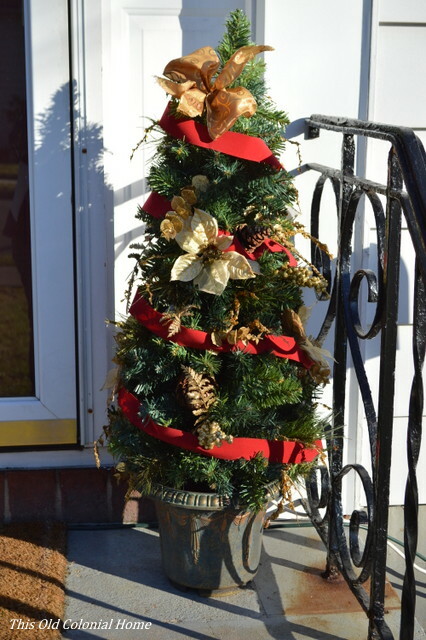 New this year is the little gold tree on our front steps. This was also a trash pick. (I think I have a problem!) I added the red ribbon to tie it in better with the rest of the décor. 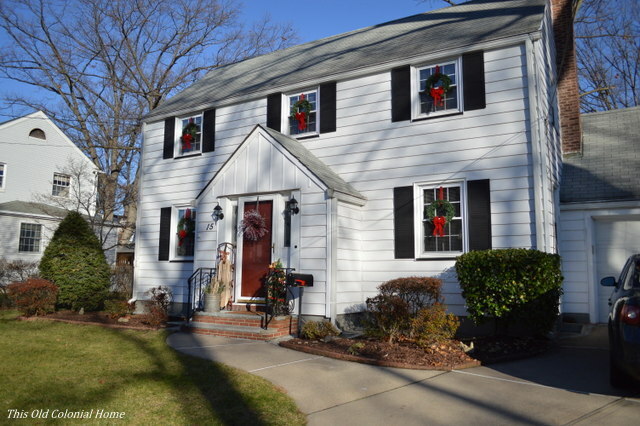 Along with some lights and candles in the window, that’s all it took to make the outside of our home ready for the holidays. And here’s how it looks all lit up at night. The camera never quite does it justice. Christmas lights are so magical don’t you think? 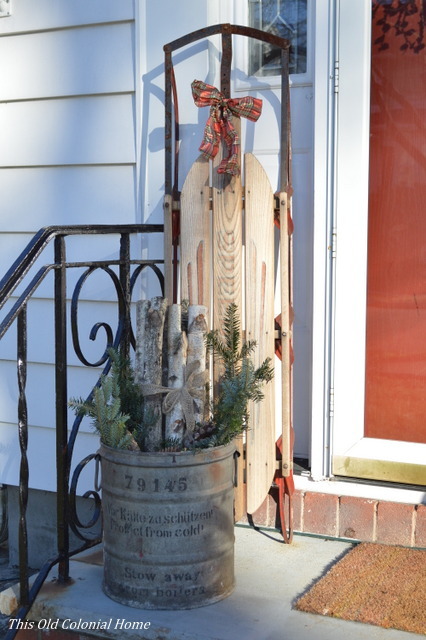 What are some of your favorite outdoor decorations? 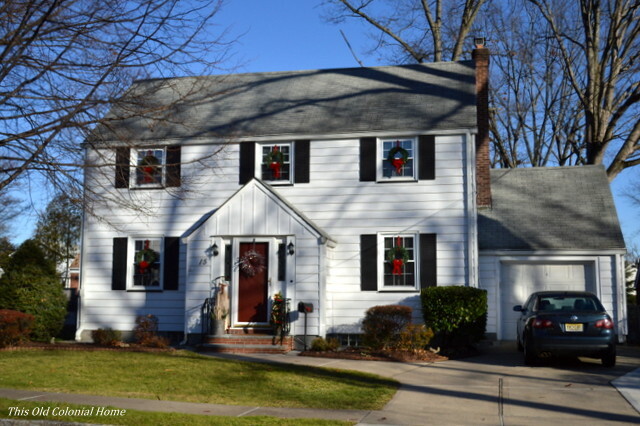 Categories: Christmas | Tags: bows, Christmas, colonial house, windows, wreaths | Permalink. Did any of you score some post-Christmas deals?! I usually avoid the stores after the holidays, but while visiting my parents I happened to see an ad in the paper for Hobby Lobby – 66% off all their holiday decorations! This was an opportunity I knew I couldn’t miss, especially since we don’t have a Hobby Lobby near us in Jersey. My mom was gracious enough to join me, and boy did she help me snag some good deals! I knew I needed a wreath for our front door. I had picked out a typical green pine one, but she talked me into this one, and I’m so glad she did! It’s so unique! 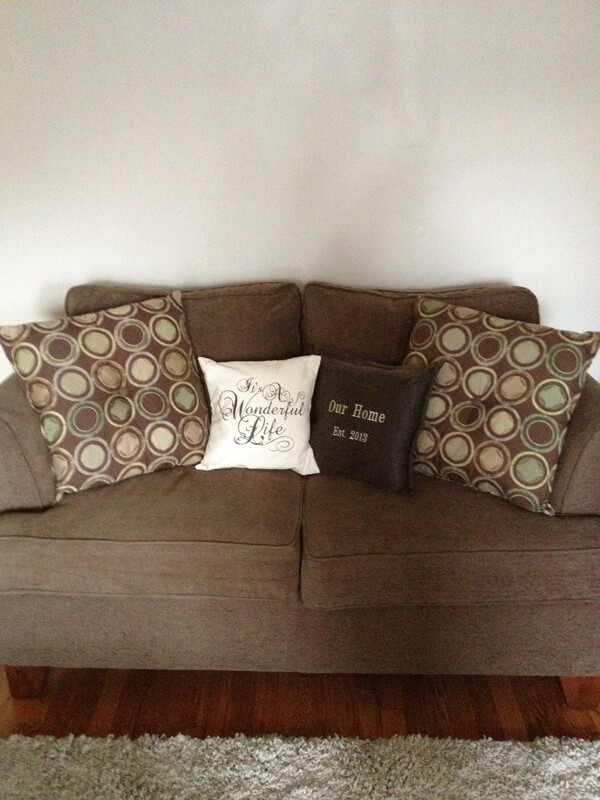 The best part – it was originally $70, I got it for $23! Here it is on our front door. I don’t think the picture quite does it justice. 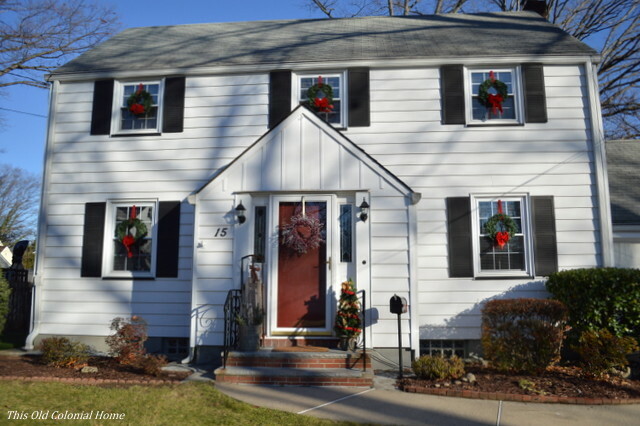 Since we have a colonial house, some year I wanted to get wreaths to hang on all of our front windows. Well, next year I’ll be able to! 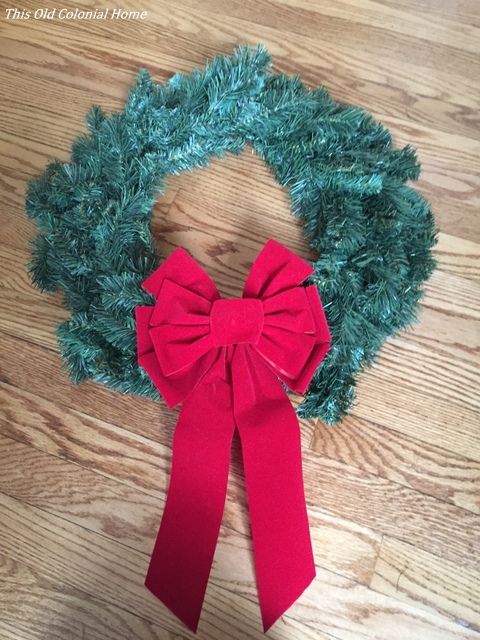 I also scooped up 5 wreaths, bows and ribbon for a total of less than $25! We also received several gift cards, which will come in handy as I start to decorate more (look for a gallery wall coming soon hopefully). And we received new light fixtures for our entryway. Check back for that post shortly. And of course, Christmas wasn’t just about the deals and gifts – it was a chance to celebrate our faith, spend time with our family and friends, and to slow down just for a little while. We hope you were able to do the same! 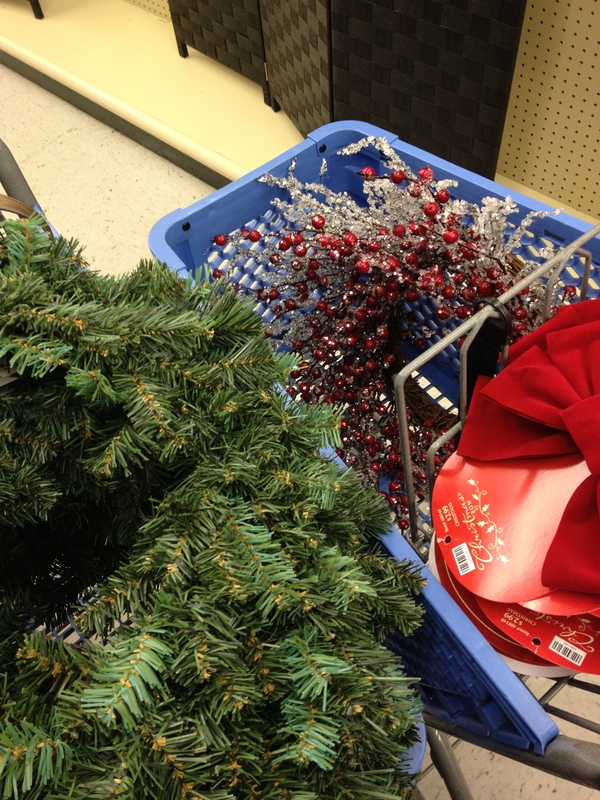 Categories: Christmas | Tags: Christmas, decor, wreaths | Permalink. We hope your Christmas was filled with many blessings, love and joy. 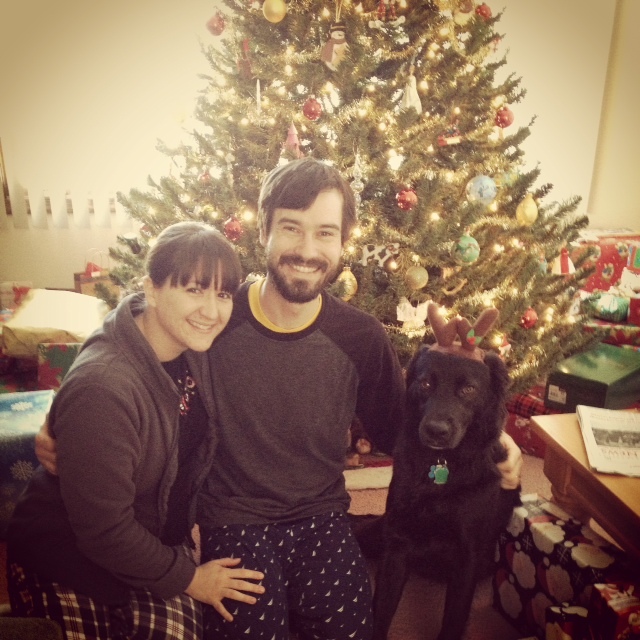 Merry Christmas and Happy New Year from our little family to yours!! Categories: Christmas, Home Life | Tags: Christmas | Permalink. 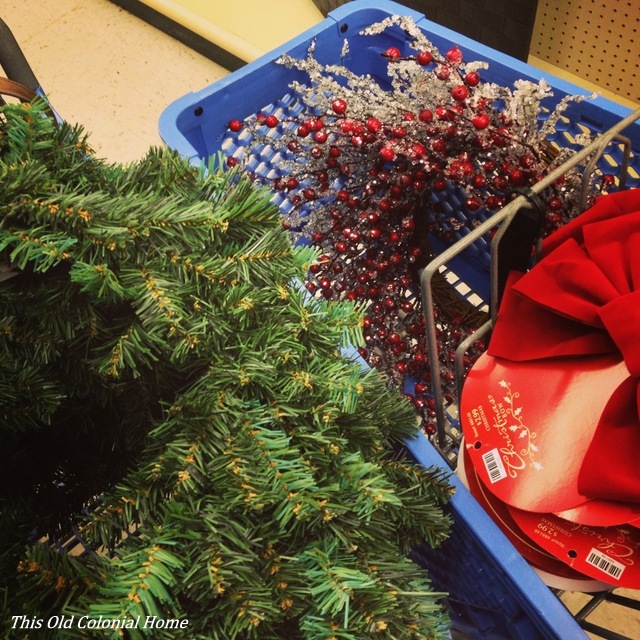 Since Thanksgiving fell so late this year, we quickly had to turn from thankfulness to the Christmas craziness. I don’t know about you, but I just can’t allow myself to get into the holiday spirit until after Thanksgiving, even if that does mean there are only 4 weeks left (eek!). 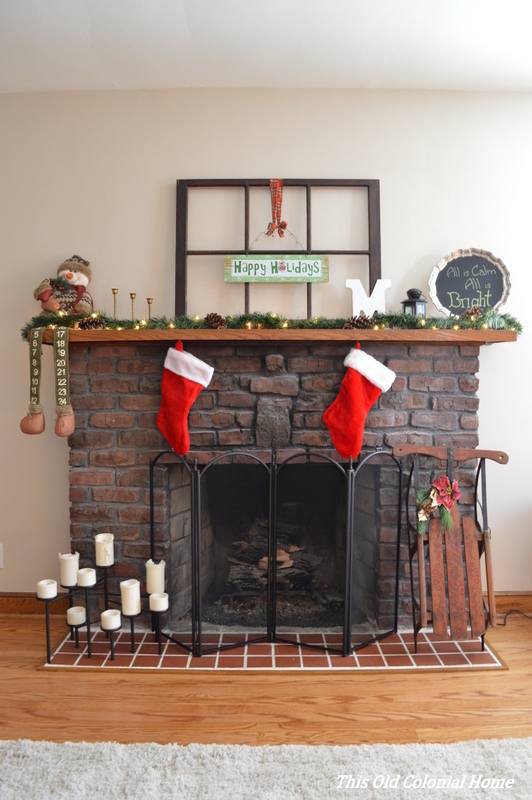 That being said, we wasted no time this past weekend getting ready for the first Christmas in our new home. 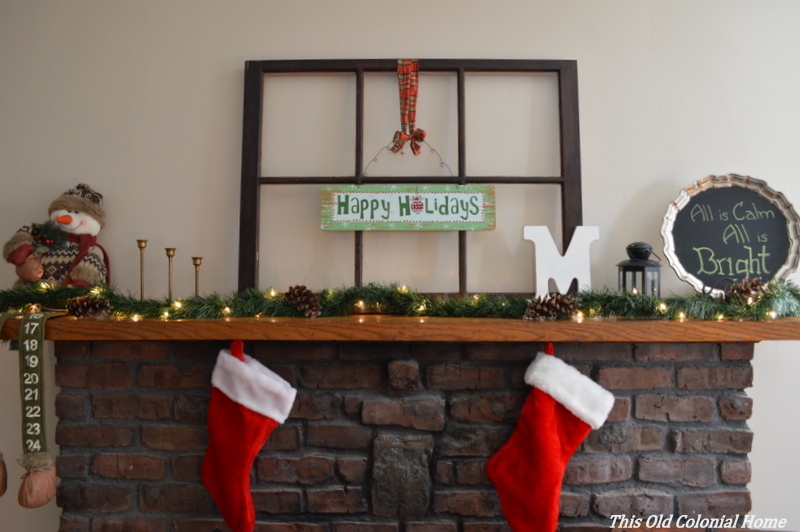 The first thing I tackled – after cleaning – was the mantel. I didn’t really have a plan of attack. 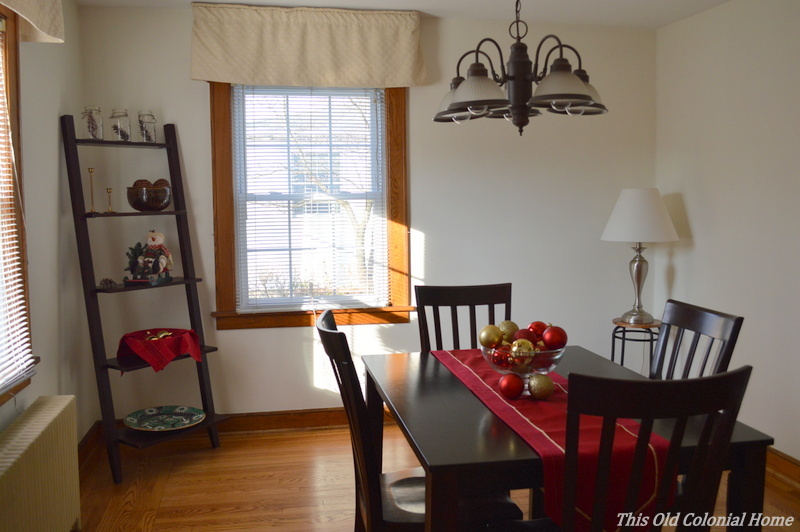 The only thing I knew I wanted to incorporate was a 6-pane window I found in the attic of our garage. So I started with that and worked around it using items I already had. 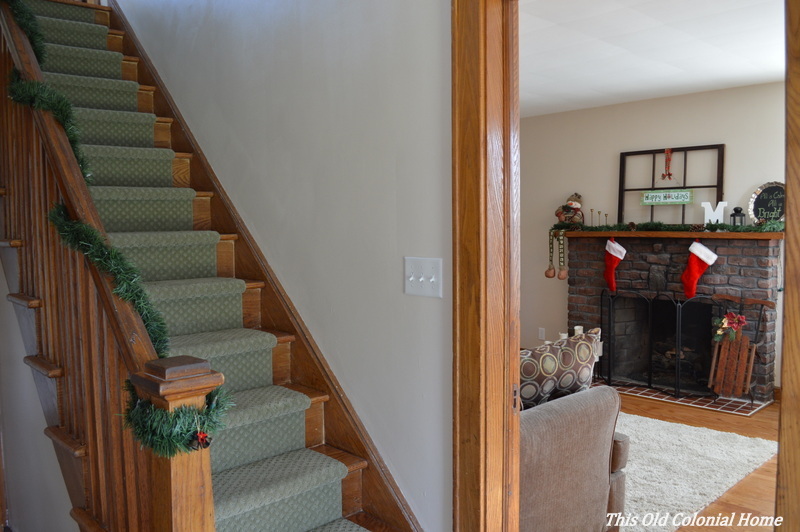 One issue I encountered – there’s an outlet on the wall above the mantel, which you can easily hide with a picture or clock, but with a window, not so much. 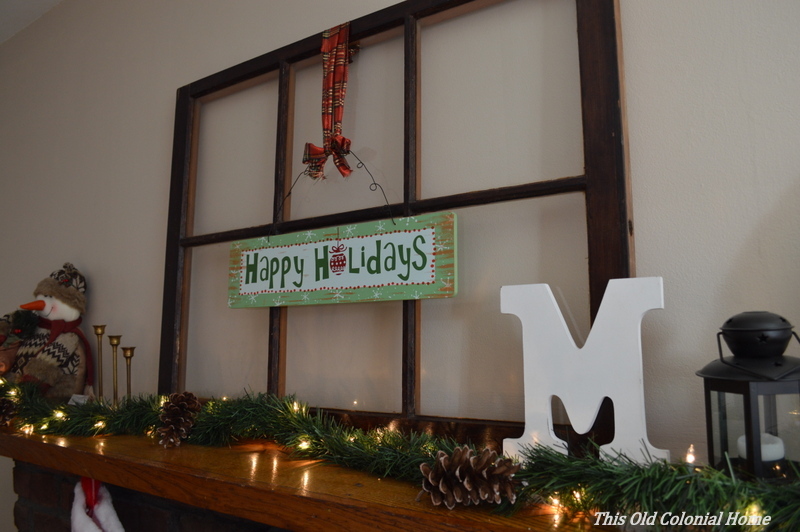 In comes the “Happy Holidays” sign. I decided to hang that from the window using gift wrapping ribbon and voila, the outlet is now strategically hidden! 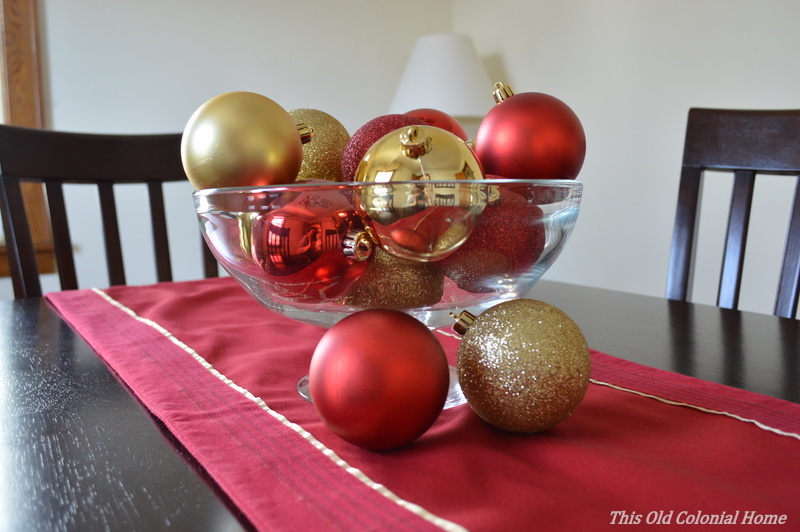 In the dining room, I changed out the table runner and added a simple glass bowl filled with ornaments. 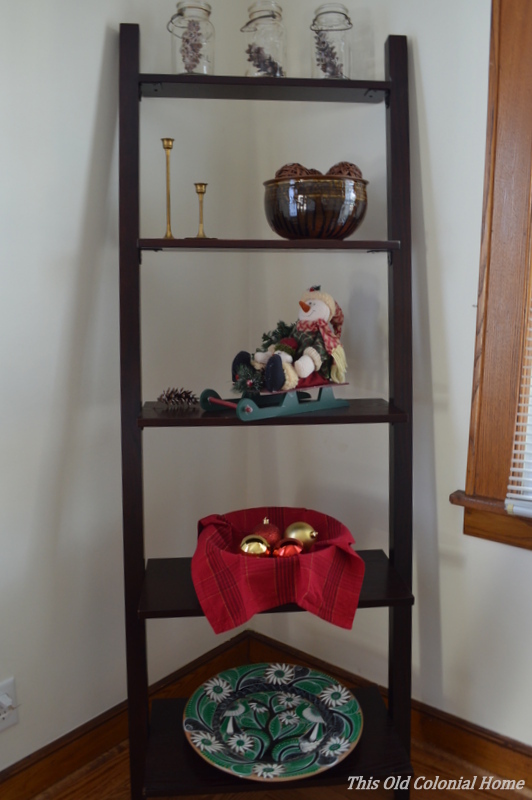 I also put a few decorative items on the ladder shelf, including 3 mason jars with pine cones inside, to carry over from the living room. 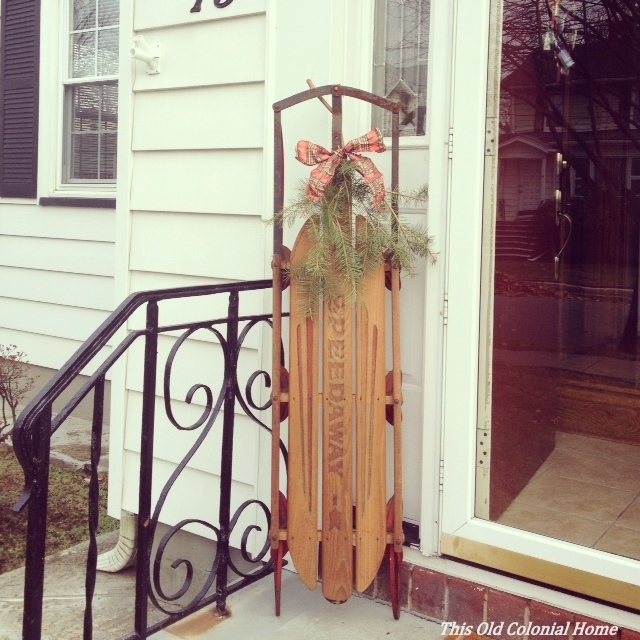 Outside, I used the larger sled on our front steps. I added real pine branches, which I found in someone’s curbside leaf pile, and I used that same gift wrapping ribbon for the bow! I am beyond happy with this decoration. It was completely free! And, of course, it wouldn’t be Christmas without lights! 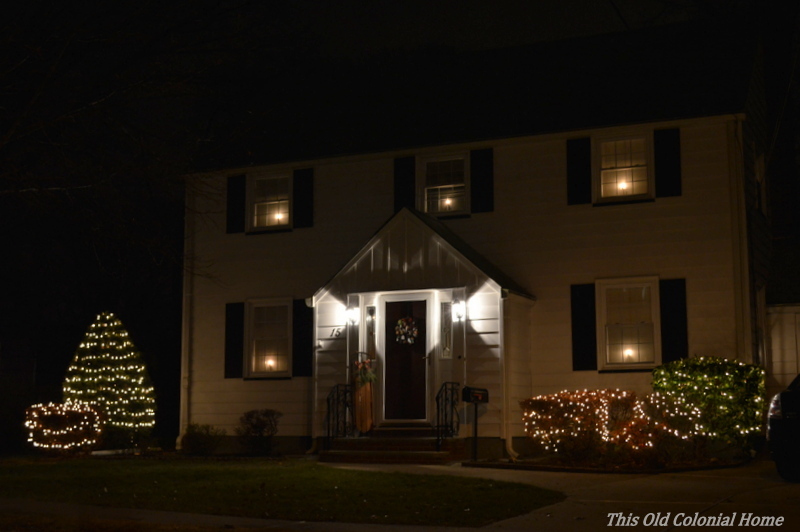 I placed candles in all of the front windows and my husband adorned the bushes. I love white lights, they’re so classy! 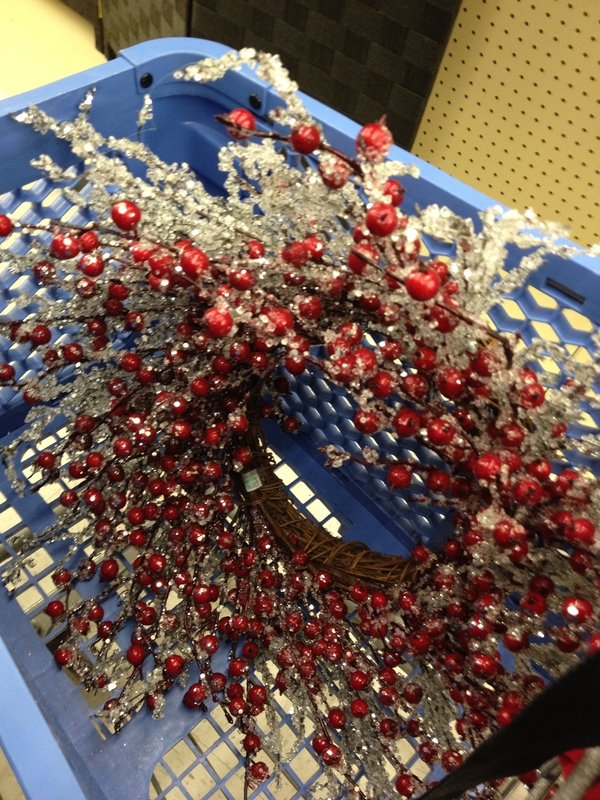 Next weekend we get the tree! 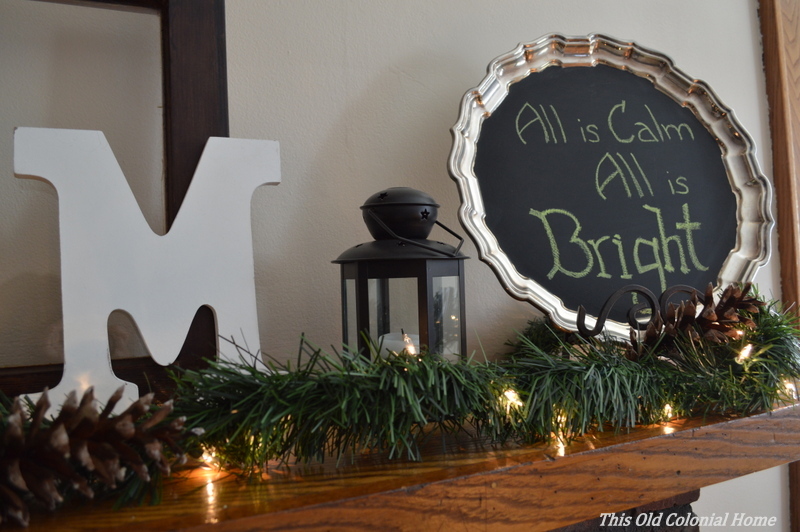 What are some of your decorating tricks? 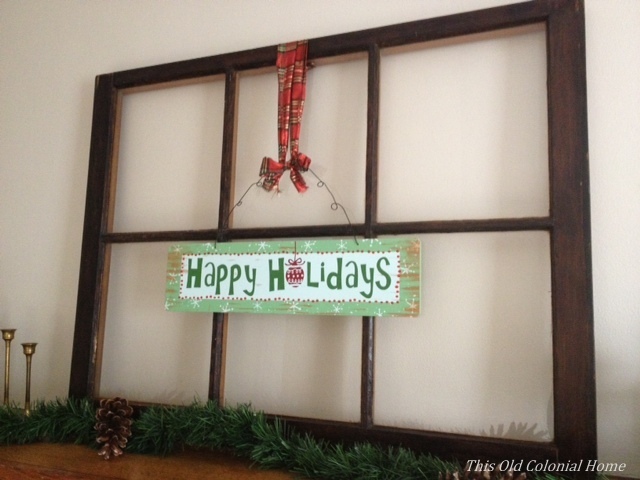 Categories: Christmas, Home Decor | Tags: Christmas, dining room, lights, living room, mantel, old sleds, rustic, window pane | Permalink.